Renaming a few of these files manually is fine, but then you’re looking at hundreds or even thousands of audio files with names like that, it can be a daunting task. Up until now there really was only one piece of software that was up to the task: VoxStudio. It’s a great program, but at over $500 (399€) it’s pricey. And unless you do A LOT of telephony work it might not be worth the expense. I spent most of the month of December 2008 working with the developer of W2, Hervé Chain (RV to his friends! ;-), giving him suggestions as to what I - as a voice talent - would want in a program like this. With each upgrade/revision that he made to the program, I told him what was working and what wasn’t. I have to say that when it comes to customer service, Hervé gets an A+. YES! The French can be nice, helpful and fun to work with! Whenever I had an issue or a question, he was right there with an answer and was open to all of my suggestions. Personally, it was a real blast to see suggestions that you make as a user, actually appear in a product! • We get scripts in either Word Table .doc format or Excel spreadsheets – W2 imports scripts in both formats. • We record many files at once – W2 can import up to 500 file names and associated prompts/paragraphs at a time in batches. This means that if you have 2000 files to record it imports the first 500 file names/prompt scripts, you record them and then it automatically imports the next 500. No need for YOU to manually cut-up the script. This was a major upgrade for the first version. • We need to provide separate files with individual names – W2 names the files as you record them based on the imported recording script. • We don’t want to name files manually! Did I mention that W2 names the files as you record them? • You can adjust the font size within W2, no need to play with text wrapping and cells in the original excel spreadsheet. 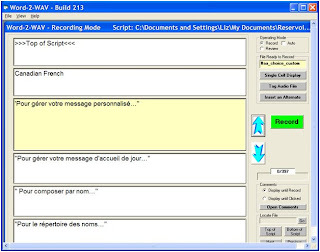 • You can see the content of more than one cell - If you record foreign language scripts like I do, you can either have the translation imported into the same cell you are recording from or have it come up as a separate “comment” – this is very handy for some phrases that can be said different ways depending on the context. • You can choose from several bit/sampling rates to record in. • You can record an alternate take on the fly and W2 will create a separate audio file, naming that file with the original file’s name and “ALT” after it. Keep in mind, this is NOT an audio editing program. In other words, once the files are recorded you must use your own preferred editing program (Audition, Audacity, ProTools, SoundForge, etc) to edit & cleanup the files. You may need to get used to the fact that you don’t see a meter as your recording, but as voice talent, we’re pretty consistent, so after recording a file for level, you can be pretty sure that your levels will be fine. The trial version will expire after 30 days but you’ll be able to put it through all its paces in that time. And as I said earlier, Hervé is very open to suggestions & comments. In the interest of full disclosure: After all the input I gave him, but before this review was published, Hervé gave me a permanent licensed version of W2. I will tell you though that I would have bought the program anyway. It is well worth it. I am now off to record a 9000 word French e-learning narration that needs to be cut up into 401 separate files. You know what software I’ll be using! Hi, Liz! Thank you so much for writing this detailed review of such specialized software! I haven't actively sought phone system work because I hated the tedious part of creating hundreds of small files. Making time to research and test new software has always been a challenge, so it's quite helpful when another voice talent can provide an enthusiastic recommendation for a product. Thanks again, and best wishes for your continued success! Thanks! Glad it's of use! Just a note about the main difference between W2 & VoxStudio. 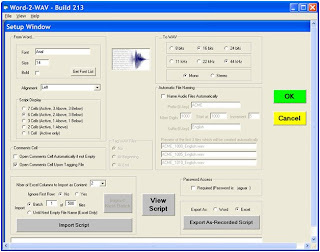 W2's main function is to create all those separate files as you go, and save them as .wav files. For most talent that huge advantage is what they need. Vox Studio does that as well, but it can also convert those wave files into the very specific telephony formats that older systems use. Formats like mu-Law .vox and the like. So most talents who don't do a lot of telephony don't need that extra step. And programs like SoundForge actually can convert to some of the most common formats like .mp3 and CCITT .wav anyway! What interesting is that more and more of my long form narration clients are the ones that are asking for separate files (like the one I mention at the end of my post) so that they can just drop each file into the video or PowerPoint or flash presentation. And - as in my French narrations - they don't have to worry about not understanding what I'm saying! They just drop in the audio using the file name as reference! So clients don't have to cut up the files, it's one less step for them, they don't have to understand what I'm saying, and they almost always ask for high quality .wav or .mp3. W2 fills all those needs. W2W is working very well for me too - and I agree with Liz on Herve's customer service. I still use Vox Studio to do most of my batch processing for telephony projects, but like Liz, I am finding that more and more non-telephony clients are providing huge lists of files with long unique file names in Excel or a Word table. I guess it makes sense for clients to "outsource" as much of the work associated with the audio as possible, it does save them time. I'm just glad that programs like these exist! I feel it's a real value added service that we as VOs can supply without spending the HUGE amount of time that manually cutting up & naming these files would take! BTW, I keep meaning to ask you...did you ever use "BitWorks?" It was a DOS based program, the first of these types of programs that I knew of, about 15 years ago. But the developer stopped upgrading it and it wouldn't work on any machine past Win98! This program sounds fantastic, especially for VOs that aren't as comfortable with all of the functions of their recording software. How great that you got to work with this guy, too! Score one for the voice talents!! And Bitworks...that really was some easy to use software. Not as spiffy as W2 but 10 years ago it made things a lot easier. I still have my special keyboard that helped my fingers fly around. Hmmm, perhaps I should put it back to use again with Cool Edit and Sound Forge. 'Hope you don't mind that I wrote about your evaluation of W2W, and posted numerous links to this article in my most recent blog post. VERY nicely done. 'Guess I know where my next paycheck is going.